Chines smartphone giant Xiaomi has launched rocked the Indian market after launching it’s mid-range smartphone, Mi3 priced at Rs 13,999 in Metallic Grey colour online through Flipkart but Now launched it’s budget smartphone, New Redmi 1S in Indian market priced at Rs 5,999 only in Metalic Grey colour option. It will lock horn with Google Android One. stunning color from almost any viewing angle. 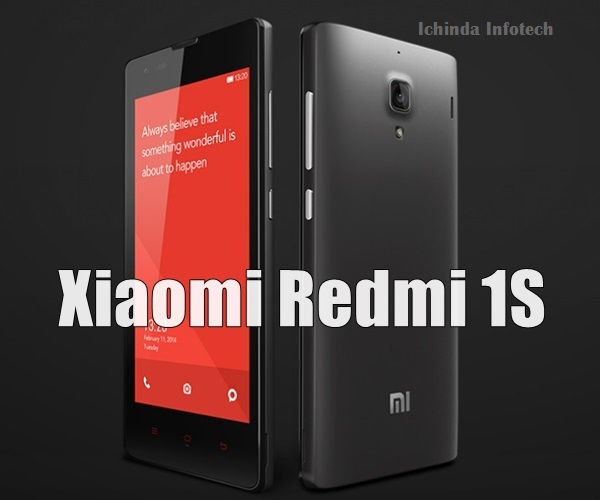 Redmi 1S mind blowing multi-tasking because it’s runs on tweaked version of the Android 4.3 dubbed MIUI version 5 powered by a 1.6GHz quad-core Qualcomm Snapdragon 400 MSM8228 processor with 1GB RAM, 8GB internal memory expandable up to 64GB via MicroSd card. For shooting Redmi 1S offers you dyal camera, a 8-MP rear camera with ƒ/2.2 aperture, 28mm wide angle lens and 1080p video recording With an extra large 1.4ųm sensor and a 5 plastic lens and 1.6 megapixel front facing camera with HD video chatting at 720p. Redmi 1S is powered by a powerful 2000mAh battery promising 500 hours of standby time, 50 hours of music playback, 25 hours of talk time and 21 hours of 3G Internet use comes in a dimension at 137.00 x 69.00 x 9.90mm and weight just 158 grams including 3G, Wi-Fi, Bluetooth, USB and GPS connectivity. At last few honest word from heart that the all new Xiaomi Redmi 1S is going to be the best smartphone of the era. Please be open to write a review.